The International Trade and Business Law Review publishes leading articles, comments and case notes, as well as book reviews dealing with international trade and business law, arbitration law, foreign law and comparative law. It provides the legal and business communities with information, knowledge and understanding of recent developments in international trade, business and international commercial arbitration. The Review contributes in a scholarly way to the discussion of these developments while being informative and having practical relevance to business people and lawyers. The Review also devotes a section to the Willem C. Vis International Commercial Arbitration Moot and publishes the memoranda prepared by teams coached by Professor Gabriël A. Moens. The Review is edited at the Murdoch University School of Law in Perth, Australia. The Editors-in-Chief are Mr Roger Jones, Partner, Latham & Watkins LLP, Chicago and Gabriël A. Moens, Dean and Professor of Law, Murdoch Law School. It is an internationally-refereed journal. 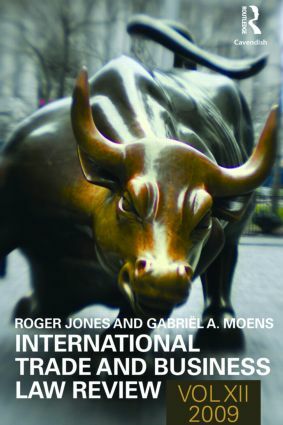 The Review is supervised by an international board of editors that consists of leading international trade law practitioners and academics from the European Union, the United States, Asia and Australia. The Student Editors for Volume XII are Sybil Almeida, Gianni Bei, Luke Rotondella, and Nicholas Summers from the Murdoch Law School.